Close your eyes and imagine with me for a minute. Are you ready? Eyes closed? Okay, good. You have all the ambition in the world and you look at your peacefully sleeping kids and make a resolve to do everything you can for their health and happiness. (Yes, in your imagination, your kids are still asleep and they are the perfect, angelic little children that you always knew you would have. Wink wink)! With this new ambition, what would you do to encourage your child down the road of healthy living? 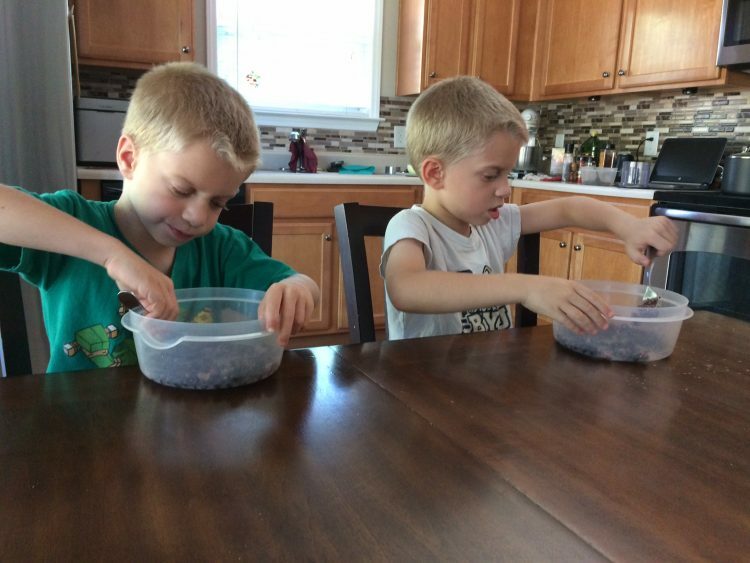 When I think about what I would do to encourage a healthy lifestyle for my three kids, the age-old “cook them healthy meals” definitely comes to mind…and when it does, I feel an almost-audible groan creep up from the pit of my stomach. Healthy meals takes TIME (of which I have little of). MONEY (which clearly does not grow on trees). And GOOD IDEAS. So naturally, when I came across this menu idea, I thought it my parental duty to share it with other parents who may suffer from the same motivational ailments as I do. I like this Veggie Burger recipe for a number of reasons. First off, these burgers are kid-friendly. 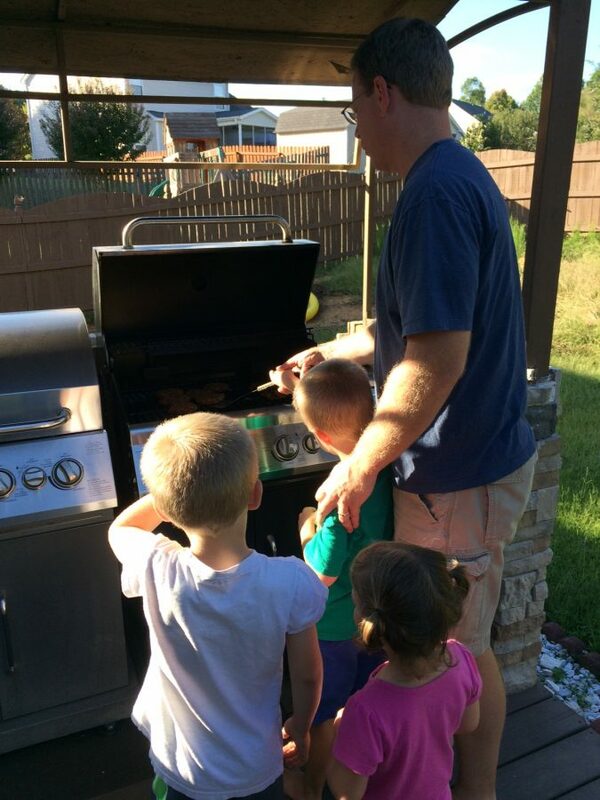 My kids LOVE hamburgers… and almost anything grilled. I’m not sure if it’s because of the actual food, or that they get to help their dad grill it! Secondly, they are healthy. It is right in line with the Mediterranean style of eating and has a lot of ingredients that you may already have on hand. And lastly, they are easy. These burgers are very simple to prepare. I even invite my kids into the kitchen to help. It always seems that if I can get my kids to help cook dinner, they are so much more invested in eating it! 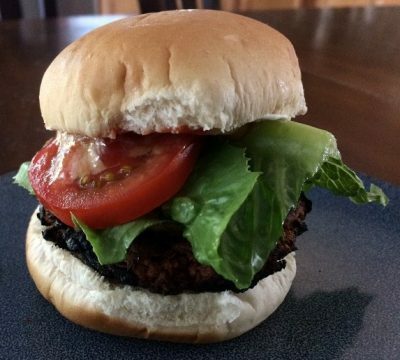 These veggie burgers aren’t just easy and healthy, they’re delicious! My carnivorous husband was pretty skeptical at first, but after seeing the beautiful grill marks on the burgers, he thought he was safe to give it a try. With the ground nuts in the burger, it’s a very hearty and filling meal, even for your meat-eating counterparts! First, you’ll want to cook your rice. There isn’t any special way to do this– just follow the instructions on the package. While your rice is cooking, heat a skillet over medium heat and add your raw walnuts (or your substitute) and “toast” for 5-7 minutes. You’ll want to stir the nuts quite a bit during this time or they’ll burn quickly! When the nuts start to turn golden brown and smell delicious, you’ll know you’re done toasting. Take the nuts out of the skillet and let them cool. Now with the same skillet, add 1/2 tablespoon of oil and your onion. Season with a bit of salt and pepper and saute’ for 3-4 minutes. You’ll know it’s done when your start to smell the onion and notice its soft and translucent appearance. Take it off the heat and set it aside. 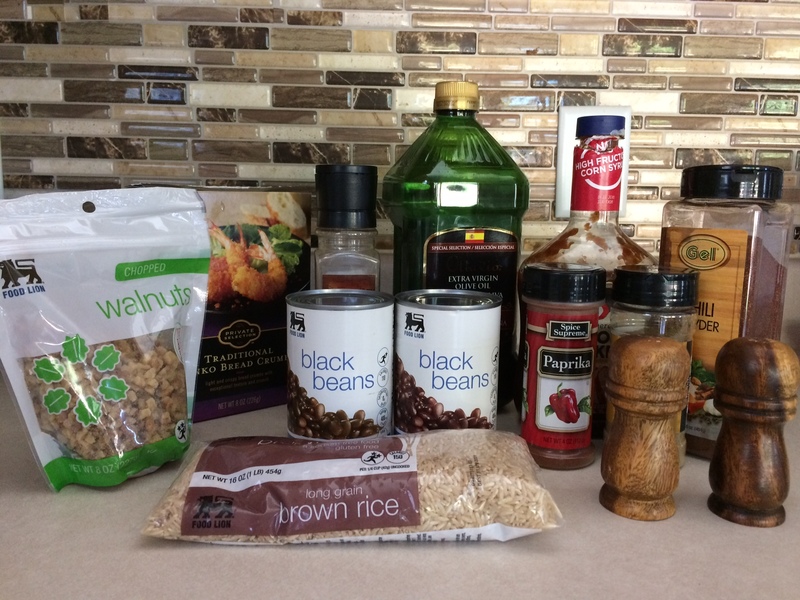 Once the walnuts (or your substitute) are cooled, I simply put them in my food processor (or blender) along with the chili powder, cumin, paprika, salt, pepper and sugar. Grind away until it’s pretty fine. I suspect you could also use a blender and it should work just fine. After you’re done, set the nut mixture aside. Take your black beans and wash and rinse them and pat dry with some paper towels. You’ll want to remove all the moisture that you can. In a large mixing bowl add the dried black beans and mash well with a fork. As you can see, I let my kids go crazy with the mashing! They loved it and it saved me some work. I usually only leave a few whole beans in the burger patties. Next, I added the cooked rice, nut mixture, cooked onion, panko bread crumbs, and BBQ sauce and mix thoroughly for 1-2 minutes. I usually let my kids help with this process too! Mix until a moldable dough forms. If it’s dry, add more BBQ sauce. If it’s too wet, add more bread crumbs. Form your patties (if my burger buns are pretty large, I make around 5 patties– 1/2 cm in size; if they’re smaller, I can usually make around 10–1/4 cm in size). Heat the grill and brush the grill surface with oil to prevent the burgers from sticking (you can also cook them in a skillet on medium heat). Cook for 3-4 minutes or until well browned on the underside, then flip gently. These burgers aren’t as firm as meat burgers, but they’ll definitely hold their shape. Cook 3-4 minutes on the other side. Okay! You’re done! When you see those beautiful grill marks on the burgers, you’re ready to take them off the grill and enjoy! I usually top the burgers with all the usual fixings that I put on meat burgers. 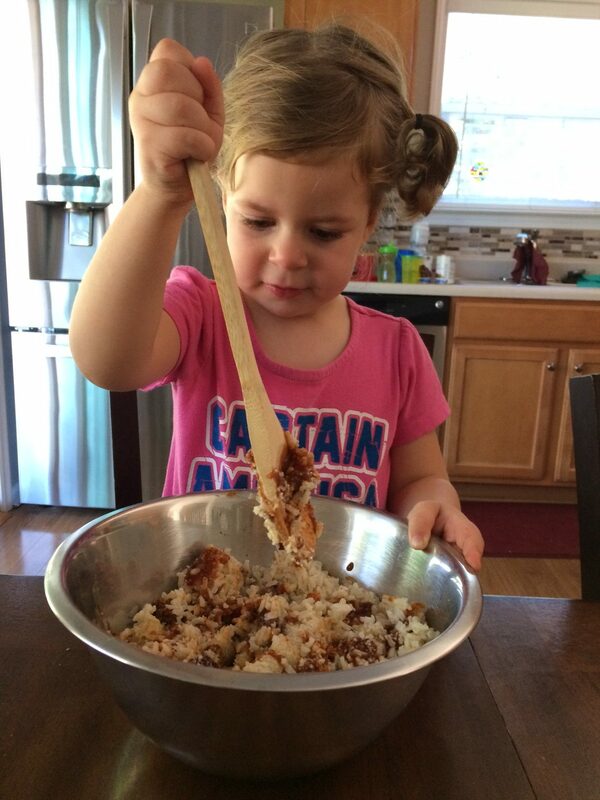 Now relax and enjoy– and pat yourself on the back, you just made a healthy, kid-friendly meal!